Hello Loves! 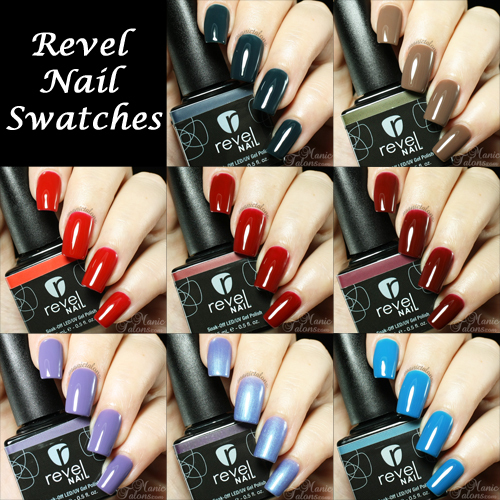 As promised in a previous post, I have several of the fall appropriate shades from Revel Nail's Spring Collection to show you today. There are many gorgeous shades in the original 24 colors from Revel, some of which I have already shown you. I won't repeat those, but I'll link to them at the end of this post. Let's jump straight into the swatches, shall we? The first fall appropriate color from the Revel Spring Collection is called All Nighter. All Nighter is a deep, muted blue cream. Application is nice and it levels well. I swatched three coats below, but two might be enough if you don't have strong VNL. Roast is a medium hazelnut cream. This one reminds me of my second love - coffee! Application is standard for Revel (aka very nice) and she is opaque in two coats. Side note: What's up with that label? It's not even close to the color inside. Festival is a true candy apple red cream. This one leans a little orange as far as reds go. I swatched two coats below but you might be able to get away with one. Roister is a darker, blood red cream. This one is more of a blue toned red, which I absolutely love! Application is nice, but this one definitely needs two coats. If you prefer your reds even darker, Deeva is your girl. This vampy, blue toned red with brown undertones is nothing short of perfection. I swatched two beautiful coats below. You might call me crazy for including these next three as fall shades, but I've never claimed to be sane. ;) These could definitely go either way in my opinion but I would wear them in the fall so they're in this post. Carouse is a medium lavender cream that applies like warm butter. She needs two coats to be fully opaque but darkens up a bit more with the third coat. Hysteria is probably the most questionable shade I've selected for Fall. This gorgeous purple base has a distinct blue frost that makes it very shifty depending on the lighting. This is a great choice if you're looking for an unexpected pop of color this fall. ;) This one does need three coats for full opacity, but the final result is well worth it. Finally, Spree is a dark sky blue cream. Or maybe dark smurf blue? I don't know how to describe it, but I love this shade. Of course I do...it's blue, right? I swatched two coats below but this one could easily be a one coater for most. As I mentioned before, there are a few other polishes in the spring line that I have shown you in previous posts. I'll list them with links to the original posts below. *The gel polishes featured in this post were provided by Revel Nail for my honest review. I ordered the entire spring collection, but my 3 children are giving this to me for Christmas!! I am looking forward to trying them. I did take advantage of their free sample and got Passion with that. The application is great, but two of my nails chipped (one on day 2 & one on day 5)When I get to try my Christmas stash I will probably use a different top coat. They have great colors.